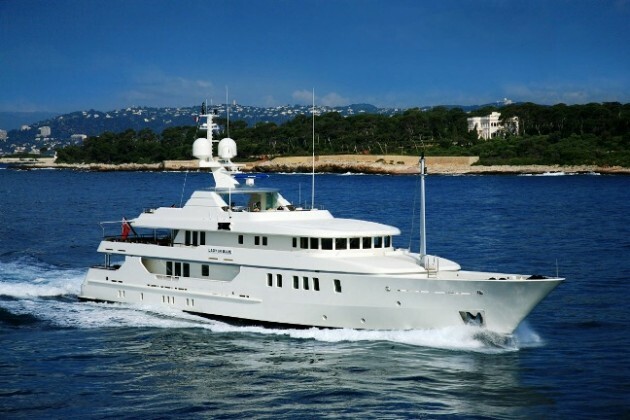 Lady in Blue – Superyachts News, Luxury Yachts, Charter & Yachts for Sale. Light, spacious and modern interior are the main characteristics of this stylish Holland built Amels motor yacht, as well as the wide range of indoor and outdoor water toys and amenities. Extra interior volume has been added on by extending the main superstructure by several metres over the 52 metre hull. The aft bridge deck lounge and the main sundeck have been specifically designed to accommodate large numbers of guests. Lady in Blue offers also a well planned deck space. She offers guests all the possibilities they could imagine, having had an extension added to the superstructure of the well proven 52-metre hull form. Main saloon offers formal dining for 12 guest. The dining area can be completely separated with decorative movable panels. Swimming platform & Bridge Deck can be easily accessed from the Lady in Blue’s Aft Deck, with a large comfortably shaded area. Entertainment centre in her Sky Lounge is equipped with a large 42 inch Plasma TV&DVD&CD, a console DJ, a Karaoke center, an authentic fire place. Also offers a casual dining area to the aft for six guests. Bridge deck includes a shaded open deck, offering informal dining space for up to 8 guest, aft couches with table and four cushioned chairs. Jacuzzi, Sun pads, Convertible Sun beds, Bar, Treadmill and Step machine are all offered by the yacht’s Sun Deck. You can add your own comments about the yacht below when you have registered or logged on. Yacht For Sale: What is Skippered Yacht Charter?